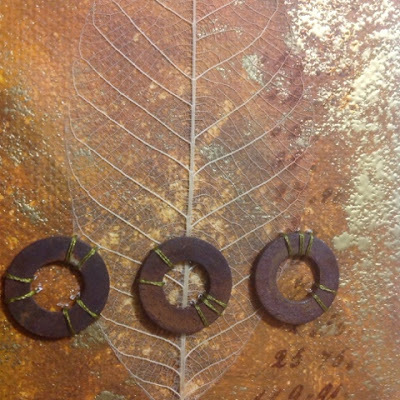 The Paperartsy challenge is asking for abstract art. I decided to try my luck with brown acrylics on canvas. 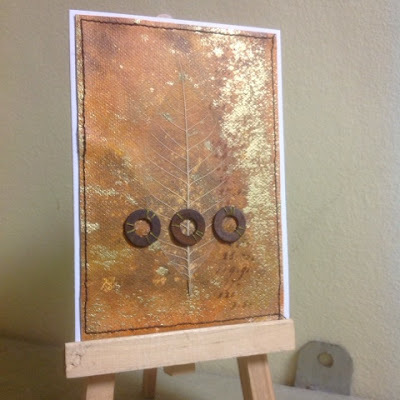 Here is the first card, still at least two to go, if I have the time to put them together :) I was inspired by the original challenge post and the neutral tones of the Two Reeds by Jo Myhill. I'm also posting for the WOW challenge (anything with embossing goes). No linkup, but entries have been linked to the comments. I painted a cheap A4 canvas sheet with brown acrylic paints, going for a distressed look (surprising what water sprays can do to half dry paint!). Inspired by the water sprays, I added Colour Bloom in Teastain... forgetting my everlasting trouble with that: it just becomes sticky in stead of drying properly. I solved the problem by spreading gold embossing powder over the piece (the next day, it was still so sticky), which gave a lovely random texture to the background. The original canvas was cut in four pieces, so I have a couple more coming... I've stamped some numbers with brown Stazon, adhered a skeleton leaf with satin glaze and sewed on some rusty spacers. Love this, simple and effective! Beautiful! The colours and shapes work together really well!